I have a very nice and expensive mechanical keyboard. It was designed for a PC and not a Mac. How do I set up the mapping, so it works like I am used to. For example, I want the Ctrl key on the PC keyboard to act like the Command key on the Mac, so when I press Ctrl-C to Copy, I get the action I am used to. I too, have a "PC" keyboard, and here's what you have to do (see attached image). Once there, click in the "Modifier Keys"
Just plug it in and off you go. 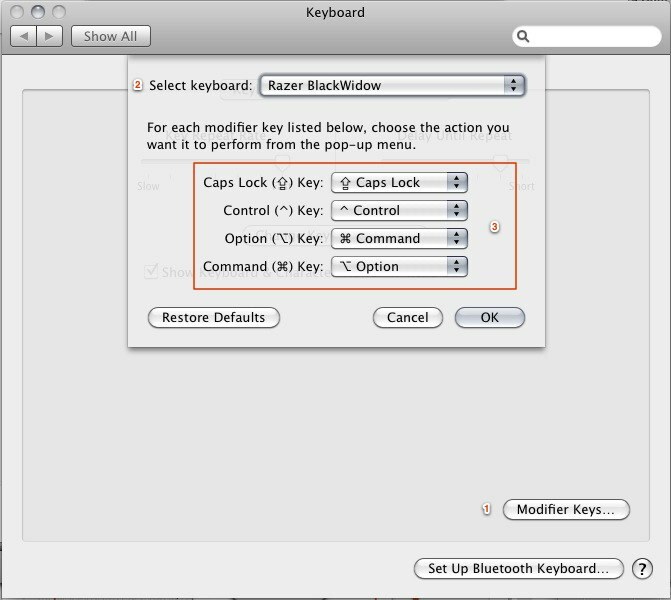 As for keyboard mappings, if you goto the System Preferences -> Keyboard, you can adjust the Keyboard modifiers there. Just set the Control key to behave like the Command key. Additional to Martin Macaroni's answer, also have a look at KeyRemap4Macbook. For example, you probably have the 'Application Key' sitting between the super key and control key doing nothing at the moment. Using KeyRemap4Macbook you can change this key into a modifier key (⌥, ⌘ or ⌃). My PC keyboard also featured a control key on the right but my MacBook's keyboard didn't, so I remapped it to option like on my MacBook. How do you position your hand to use the command key? What finger do you use? How to map the Command key to a “Windows” keyboard? Best keyboard mapping to make Ubuntu like Mac? Windows keyboard on mac, change combinations? Karabiner quit working in Sierra. How do I map my menu/application key to be Command?